Way back in early 2004 I made a trip to Seattle to visit my good friends Alok and Shruti. Here I was introduced to this board game called Carcassonne, which I really liked. Carcassonne is based on a simple concept – territory expansion. You pick tiles and you have to place them on a flat surface in a contiguous manner, trying to build cities, roads, monasteries. Obviously the person with the biggest territory wins. To win your strategy has to be really good and of course, you need to have some luck. When I decided to purchase this later, Amazon showed me a related game called The Settlers of Catan. The game was not generally available at that time and I checked all stores that I was aware of. Eventually I purchased it from the manufacturer (MayFair Games) at somewhat of a premium. Now, a common theme with me is that whenever I purchase something that is not easily available, I tend to do nothing with it for the longest possible time. To provide you with an example, as an amateur philatelist I was really keen on laying my hands on a Penny Black. I eventually managed to get it, but I just stashed it away in a box somewhere and didn’t look at it again. The same happened with Catan – I had opened the packaging, tried to understand the game and given up after seeing the volume of information that I had to go through. And so the box lay at home, gathering dust. Then a few nights back our friends Vaibhav and Swati decided to come over for a get-together with a plan to play Catan. The intent was to start early, so there were at our place by 5:30 in the evening. However I had a rather bad weekend with so much work to be done that I only freed up at around 9:00 pm on Sunday. And that is when they explained the rules. I must say that the rules seemed every bit as complicated as they had the first time. We decided to do a trial run and from that moment Tanuka and I were absolutely hooked. Catan again deals with territory building, but in a slightly different manner. For one, a game of Carcassonne can last upto an hour at the most. Catan on the other hand lasts for at least a few hours. In fact we ended up playing for four hours without completing the game and eventually called it quits. The standard game of Catan can be played with 3-4 players. You get an extension for 5-6 players as well, if you want to support more players: The Settlers of Catan 5-6 Player Extension . There are some expansions available, called Catan: Cities & Knights Expansion , Catan: Seafarers Game Expansion and Catan Barbarians and Traders Expansion . These expansions provide additional scenarios and more rules to spice the game up. The standard board comes with 19 hexagonal settlement terrain tiles, surrounded by the ocean. A settlement tile could yield lumber, wool, bricks, grain or ore, depending on what type of settlement it is (forest, sheep on pastures, hills, fields or mountains). There are 3 tiles each for bricks and ore, and 4 tiles each that give you lumber, wool and grain. The nineteenth tile is a desert, which gives you nothing. There are 18 circular number tiles, with numbers from 2 to 12, excluding 7. 2 and 12 occur once each, while 3, 4, 5, 6, 8, 9, 10 and 11 occur twice each. You guessed right – these numbers are what you get when you roll the two dice. The settlement tiles could be laid out arbitrarily, surrounded by the ocean. You might need to play this out on a table, since the layout requires space. The number tiles are placed on the settlement tiles. There is a suggested configuration provided with the game for beginners. The fact that you could do an arbitrary arrangement makes things interesting – you cannot bank on playing from the same position every time. 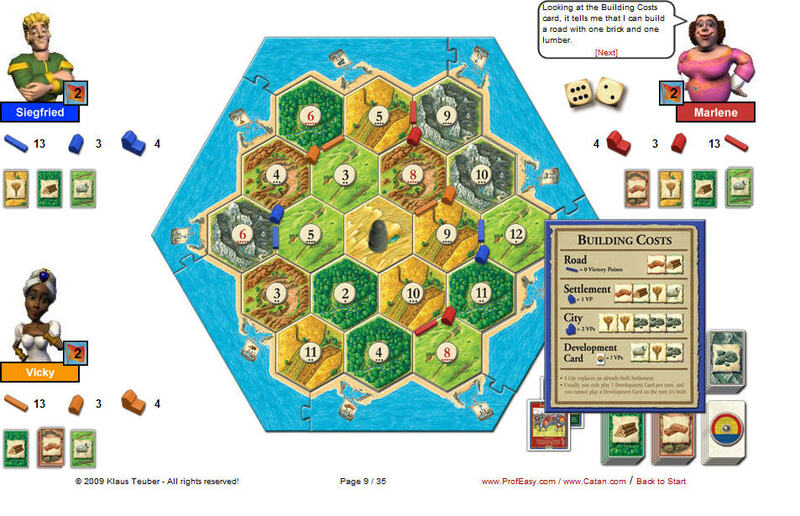 Every player starts by placing two settlements and two roads on the board. You place a settlement at the corner of a hexagonal tile, so effectively your settlement is on 3 different tiles. A road is built on the edge of a tile and has to connect to a settlement or a road that you have already built. As you start gaining resources, you can build more roads, add new settlements or upgrade your settlements to cities. Therein lies the concept of points. Each settlement that you build adds one point to your tally and each city adds two points. Roads by themselves don’t give you any points, but if you have the longest road you get 2 points. Cities and settlements have another important function – gaining resources. Each tile that your settlement is said to be on (i.e. the three hexagons) gives you resources. So if your settlement is at an intersection of lumber, wool and grain, you could potentially gain any of these resources. If the lumber that you are on has the number 6 on it, if wool has 4 and if grain has 11, then anytime that someone rolls 6, 4 or 11 you tend to get the resource from the corresponding hexagon. Resources are given out as resource cards. You might not get any resources from your roll of the dice and you might get a lot from somebody else rolling the dice. Now, if you have two settlements on the lumber tile and somebody has rolled 6, you get two lumber resource cards. If one of your settlements there is a city, you get 2 lumber resource cards for that city and 1 for the settlement. If this sounds complicated, things get much more simplified when you start playing. When you have accumulated a certain number of cards, you can trade them for building up your property on the board. With a lumber card and a brick card you can build a road and so on. You can upgrade from a settlement to a city using 2 grain cards and 3 ore cards. A cheat sheet is provided to each player, indicating what is needed for a particular type of property. There is a stack of development cards, which you shuffle and place face-down by the side. A development card is like a good “Chance” or “Community Chest” card in Monopoly – you don’t know what you will get, but it doesn’t hurt you. You could get a card that lets you build some roads or take any two resource cards that you want etc. You can trade with other players at negotiated rates and with the bank at a fixed rate, to get resources that you require. There is also the very interesting concept of a robber, but I will let you play the game to actually figure out what it is. As you can see, the rules do appear complex. Apparently the founder Klaus Teuber had planned a much more complex game to start with, but after revisions finalized on the current form. I have to add, though, that once you play the game the rules appear much more simple. I have only played this twice and by the second time I had a full understanding of the rules. Tanuka loved the game too. Just to give you an insight of how much we liked it, I have gone ahead and placed orders for the 5-6 player extension as well as the the Cities and Knights expansion. We tried playing Monopoly the following evening, but found it significantly underwhelming after Catan. Try to get your hands on this game if you can – you will not regret the experience of playing it! Wow – nice link. I didn’t do too much research into Teuber, quite surprisingly, so it was nice to learn of his process of creation. “Monopoly Killer” is just about right – I recall seeing the title used elsewhere too. Incidentally there is a “Development Card” in the game called “Monopoly”, which lets you take all cards of one particular kind of resource from all players at the board, letting you have a monopoly. Great explanation of the rules of the game. I have been playing Settlers for many years and the fabulous thing is, it never gets boring. Thanks. Looks like you have a whole site dedicated to Catan!